Over the past two years, some marketing organizations have lost sight of kindness. They want us to believe that constantly attacking competitors, judging and criticizing are the best way to drive change and engage new audiences. This may be effective during certain pivotal or traumatic moments in an organization’s life cycle. During times of crisis, we need to move quickly and face some hard truths. But persistent negative conversations and relationships leave collateral damage in their wake. They are not a way to promote growth. They are actually a surefire death strategy. Sometimes, a lack of kindness can also happen within your current “trusted advisor circle.” How do they offer feedback and support when you need it? Do they fall prey to group think, simply agreeing with everything you say? Are they fond of criticizing and judging your strategic moves? Or, when they challenge your beliefs or business models, are they kind yet constructive? Motivational guru Jim Rohn once said: “We are the average of the 5 people with whom we spend the most time.” In our years of leading private CMO peer groups, we continuously compare achievements of kind yet direct peer group members to the highly “edgy” marketing leaders. The differences between these leaders are significant: our highest functioning members are willing to be vulnerable, and they are kind. They are present for our other members. They come from their hearts, not just their heads. As a result, they foster revolutionary, high performing teams. They earn “Best Places to Work” awards. Recruiting is joyful. 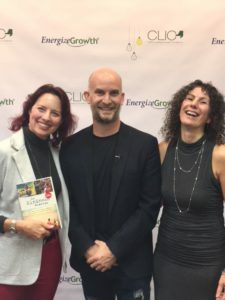 We invited Netflix star and global adventurer, Leon Logothetis, to launch our annual CMOs Leading Innovation Conference (CLIC ’17) because he has been on a 3-year kindness journey. He shared some inspiring, as well as troubling, experiences he has encountered around the globe. If you would like the entire 10-part video series from CLIC ’17, including bonus videos featuring Leon, consider joining our private marketing community. Here are the details. Take a moment to reflect on your own kindness practices. How might you start a kindness revolution in your organization?